I am happy to report that a recent essay was published in 'Atlantis' Magazine, which is published by Polis and collects writings that make "...the link between students, academics and professionals besides the Polis activities. 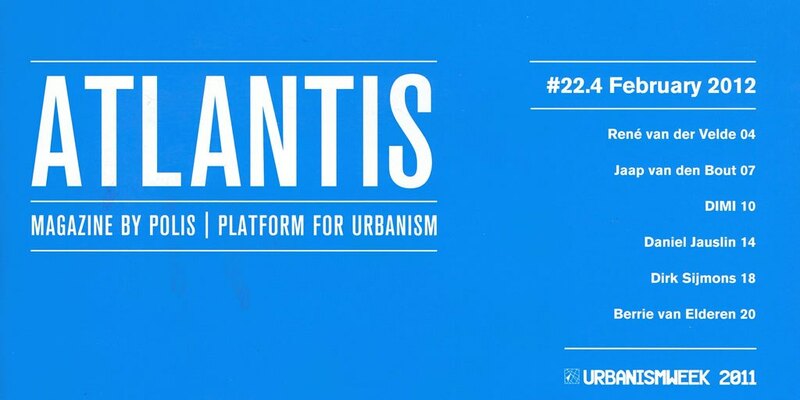 This magazine is our medium to keep you as member up to date about everything going on in the urbanism & landscape architecture world. 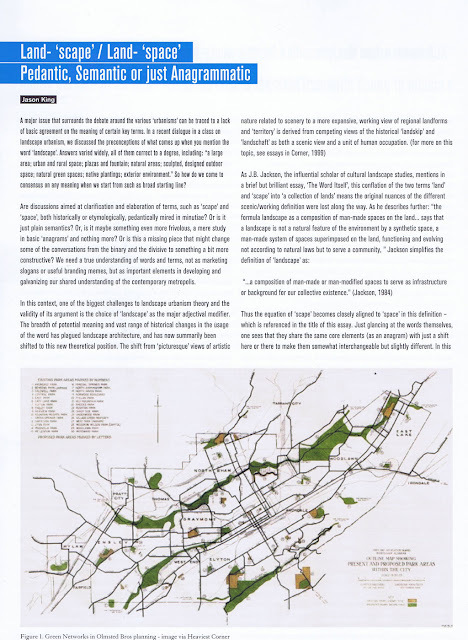 The issue 22.4 discusses concepts around the 'Urban Landscape' and features contributions from a wide range of authors. The essay "Land- 'scape' / Land- 'space': Pedantic, Semantic or just Anagrammatic" is a tongue-in-cheek play on words that carries with it a more serious message. The dialogue around landscape urbanism has been called pedantic, and the splitting of hairs could be dismissed, particularly by those uninformed and who disagree with the concepts, as mere semantics. The anagrammatic is purely a place on words. The content, revolving around an exploration of the terms 'landscape' and 'urbanism', and more specifically the parallels of the anagrammatic terms 'space' and 'scape' begin the discussion. Using definitions from JB Jackson's essay 'The Word Itself', the parallels between space and scape are delineated, as Jackson's cultural reading of landscape as "...a composition of man-made or man-modified spaces to serve as infrastructure or background for our collective existence.” (Jackson, Discovering the Vernacular Landscape, 1984) This expands our idea of landscape beyond scenery and greenery to encompass a more broad understanding of 'context'. 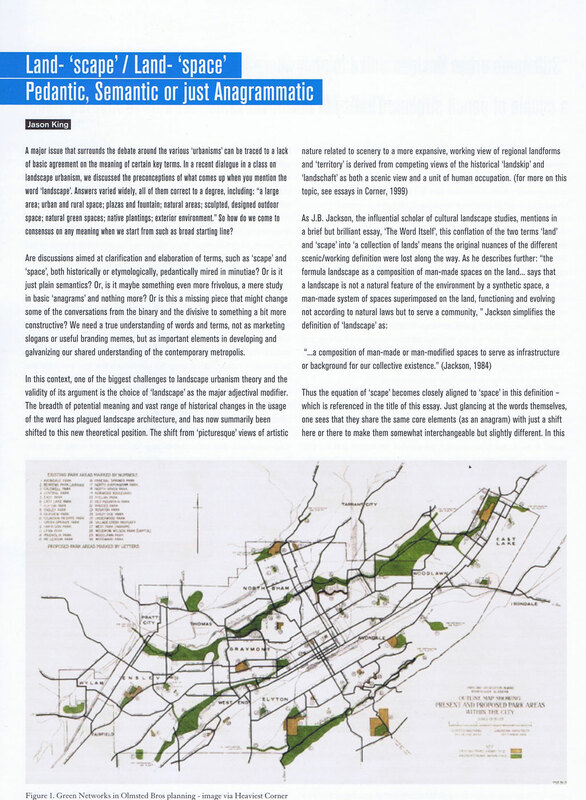 "Thus study equates to urbanism (of which there can be many types of study), and practice equates to disciplinary modes and interdisciplinary contexts, such as urban design, architecture, landscape architecture and planning (of which there can be many types of solution). The distinction allows us to avoid binary argument because there are infinite types of study and methods of solving problems – each driven by the unique context. Dialogue and critique can still operate – but there will more transparency and it won’t be summed in an either/or proposition. The complexity of urban areas in our contemporary world is too immense for only one of two solutions"
The end along with a call for more clarity in writing about these terms, specifically the need for clear definitions when discussing terms. We are too loose with terminology today, and the overall impact and reach of our discussion suffers from this. Whichever way you choose to interpret and intervene the urban conditions, there needs to be shared understanding of fundamental issues, because, as I mention: "In the end, no discussion or argument (binary or otherwise) is worth much if it happening around vague language..."
Comments and discussion, with clear definitions, always welcome. Check out the entire magazine online here, or click to download a PDF of the article here.